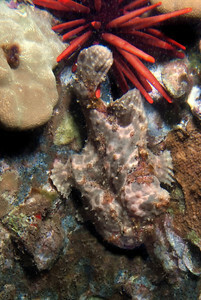 Some of the best-camouflaged ambush predators around. 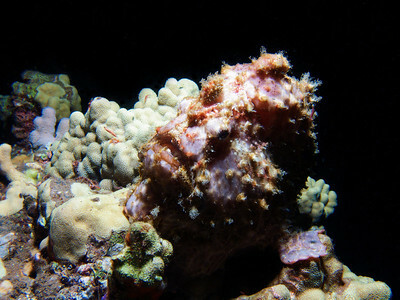 Commerson's frogfish (Antennarius commersoni), perched on the Carthaginian. 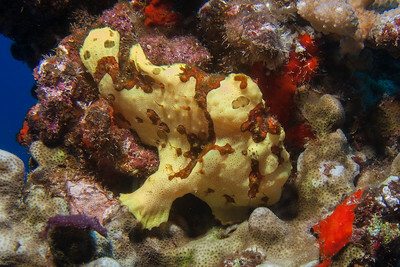 And then there was this little frogfish...which I think might be a Painted frogfish (Antennarius pictus), rather than a small A. commersoni...though it's extremely difficult to tell them apart. 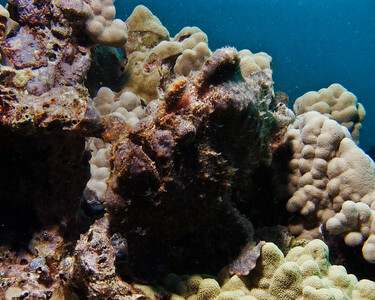 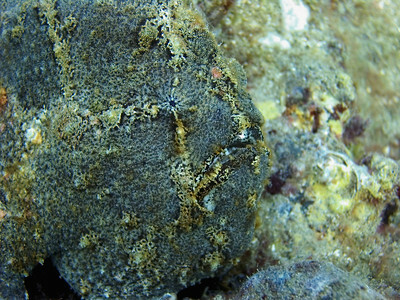 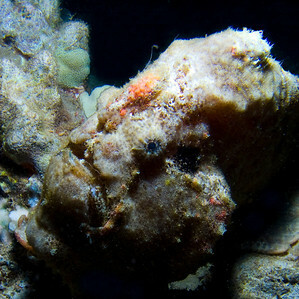 Commerson's frogfish (Antennarius commersoni), always a fun find on the reef...if you manage to see them! 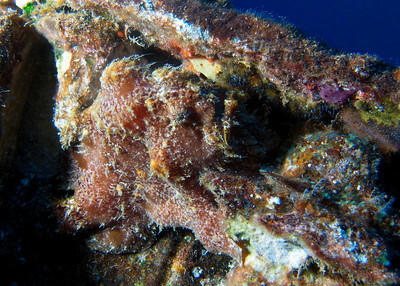 ...but as usual with A. commersoni, the background match is pretty good. 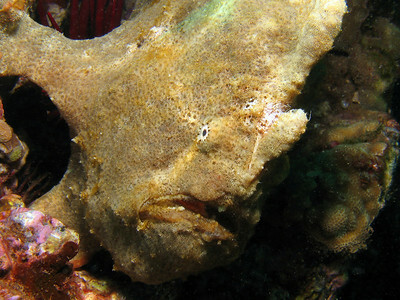 "Okay, you want sand? 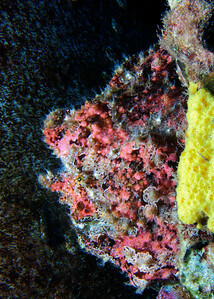 I can do sand..."
Another brightly colored juvenile...this is a sensible strategy for a young frogfish, as very few critters can be bothered to try and eat an encrusting sponge. 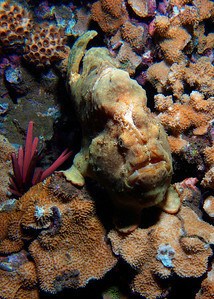 A frogfish on the hunt...if you look closely just a few inches above the eye, you can see the "fishing pole" and lure--frogfish are related to anglerfish, and use that little wisp to draw in prey, waving it about until the right sized meal gets close enough. 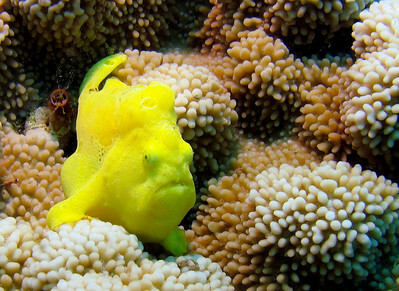 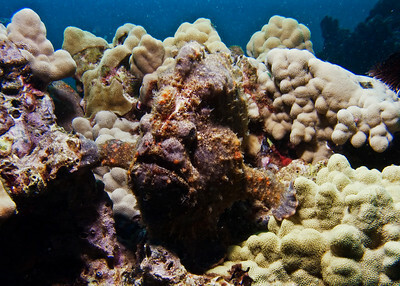 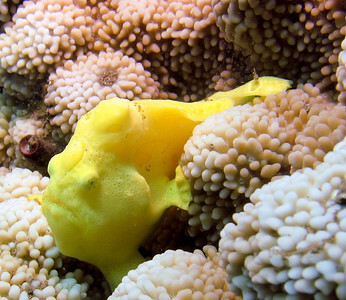 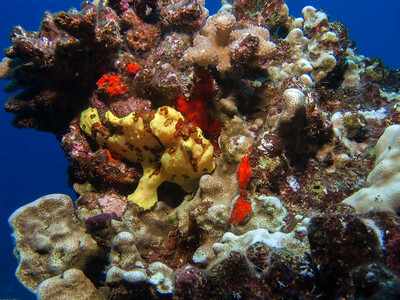 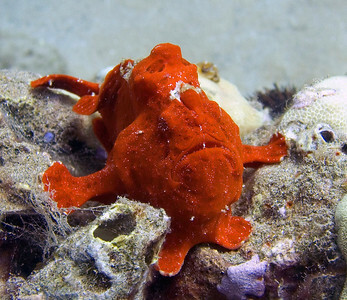 Juvenile frogfish does Marlon Brando impression...and check the color match on the sponge just behind him. 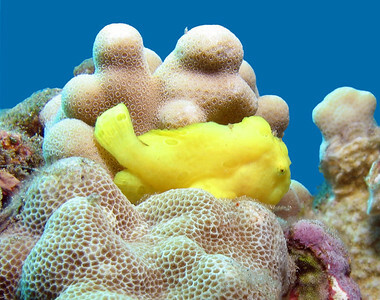 Juvenile commersons frogfish (Antennarius commersoni) on rice coral. 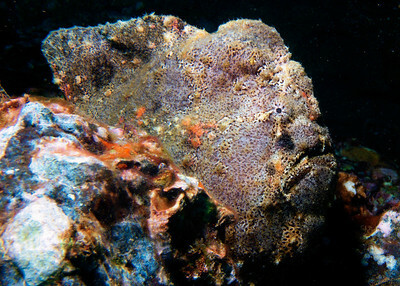 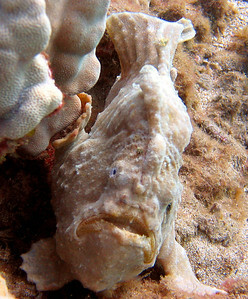 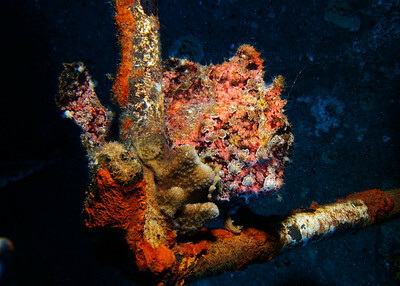 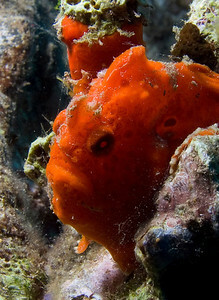 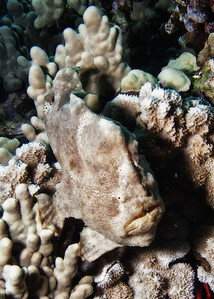 Commerson's frogfish (Antennarius commersoni). 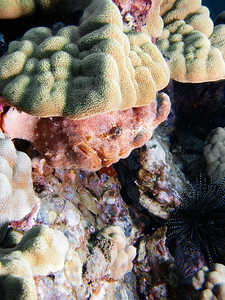 In the upper left, you can also see an amazing zoanthid (colonial anemone) with tentacles fully extended...not sure of the exact species, but as always, I'll try to find out! 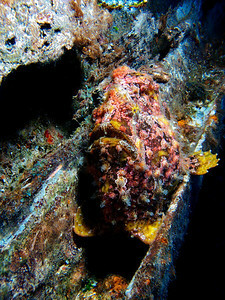 Commerson's frogfish (Antennarius commersoni) come in all sorts of colors...but this rose/purple pattern is pretty unique. 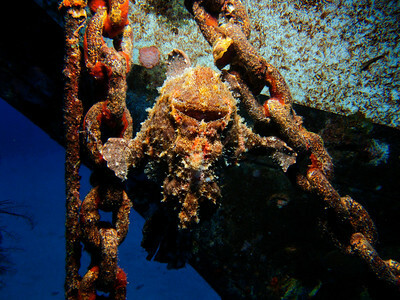 A Commerson's frogfish (Antennarius commersoni), suspending herself upside-down between the bow chains of the Carthaginian...and apparently auditioning for Cirque Du Soleil. 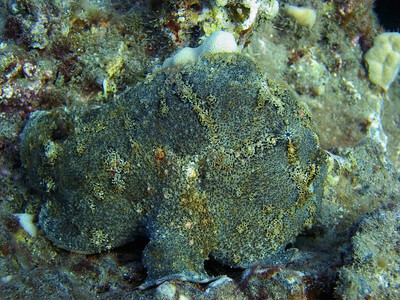 A. commersoni also comes in purple! 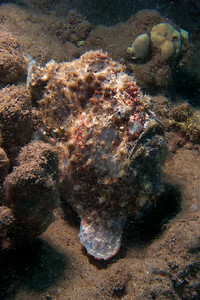 Commerson's frogfish (Antennarius commersoni), showing why it's such a gifted ambush predator.